It's stunning... it's trendy... and it's one of the finest hotels in the Maldives! Honeymoon in style at Huvafen Fushi. For more information why not call our Maldives Honeymoon Specialists for the latest honeymoon offers and prices - call 0808 168 1230. With its large clear lagoon and striking infinity pool extending over the glistening waters, Huvafen Fushi is beautiful. But it’s got substance too – the luxury villas all have private pools, there’s a futuristic underwater spa, and innovative fine dining options. And for such an indulgent resort, it’s refreshingly relaxed too. Dining is a real highlight here. Celsius is the main restaurant, with a diverse menu, and Salt is the place for gourmet seafood, inspired by its overwater setting. If you’re looking for more casual dining, Fogliani’s is a lovely al fresco venue under the palms serving up traditional wood-fired pizzas. For intimate bespoke dining, tables can be set up almost anywhere, from the shallows of the fibre-optic lit pool to a rock island on the edge of the reef. The wonderful thakurus (butlers) can arrange a host of experiences for you, whether it’s joining an ocean expedition with the resident marine biologist or embarking on a sunset cruise to spot dolphins. The LIME Spa offers the opportunity to relax under the ocean’s surface in an underwater treatment room with tropical marine life just outside the window; the perfect mesmerising accompaniment. Each of the spacious palm-thatched bungalows has a private plunge pool, with the room types differing in location – on the beach, on the lagoon or over the ocean – and size, ranging from the Beach Bungalows with Plunge Pool to the huge Beach Pavilion. High tech extras include a fully loaded iPod and a surround sound system that can play in your room, in the bath and even in the plunge pool. 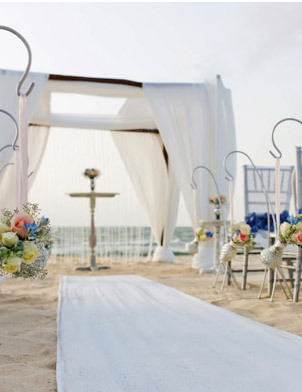 If you are thinking of saying "I do" or having a blessing ceremony then speak to one of our Maldives Specialists for more information on the various packages available.